Recently featured in the Exhibit Magazine under the column ‘Women Who Made It Big Online’, Prachi Garg is set to write another inspirational story for all those with entrepreneurial instincts. 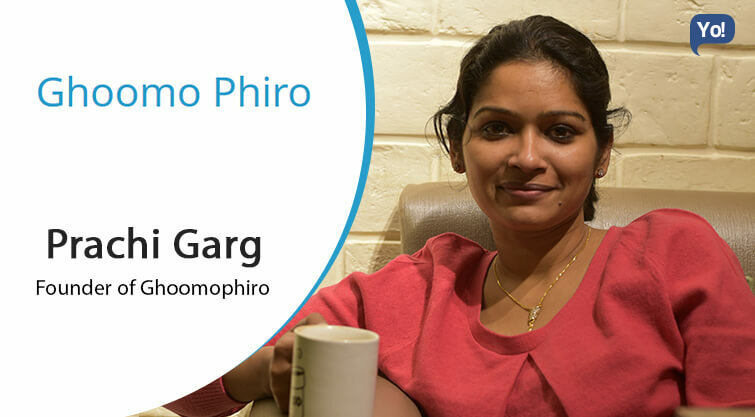 A computer science graduate & an MBA, she spent her early corporate life as an avid traveler & writer before becoming an entrepreneur by launching Ghoomophiro. Ghoomophiro is an online service that organizes corporate tours, solo woman travel and curate review of travel destinations. Prachi came up with Ghoomophiro when as a corporate employee herself she realized how important corporate tours are to improve companies’ environment & employees’ productivity. We have one life, make it grand. I started with my basic savings and have been able to pull off business from there. Never Give Up Attitude, Passion and Focus. I feel smartphone is the biggest asset for time management for me. Its basic features helps me to utilize my traveling time. Responding to my emails, queries on go. Checking my phone after every few sec. Never give up and constantly work towards your dream. Keep company of positive people. Expand more in Solo women traveling and work towards my book on couple entrepreneurship. I shall be full time writer. Leh Ladakh, Andaman & Nicobar and North-East India.